By 1972, rising insurance rates, rising gas prices and creeping EPA requirements had reduced the W30-option 455 ci. powerplant to just 300 hp and 410 lb-ft. of torque. 442's with the W30 option also received a low-restriction dual exhaust system, an aluminum intake manifold, a fiberglass ram-air hood, anti-spin 3.42:1-geared differential, and a heavy duty cooling system. 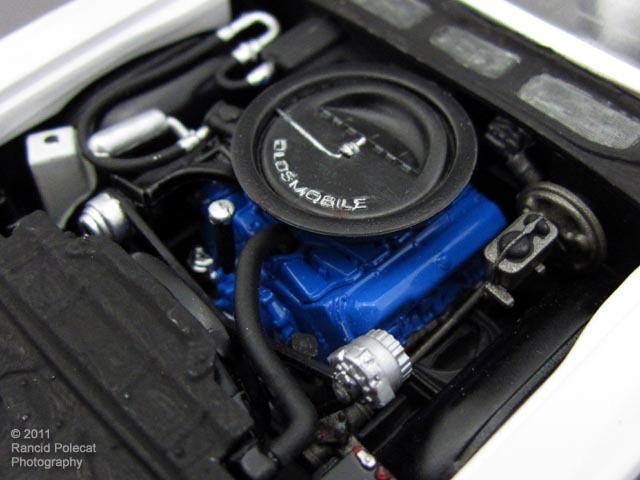 Here Gary cleanly assembled the kit engine right out of the box, again using his combination of Humbrol and Rustoleum Flat Black paints as a base in which to frame the Oldsmobile Engine Blue motor.